Regular brake pad replacement makes good sense and good driving. Since a car’s brake pads undergo a great deal of pressure every time you press the pedal, they will eventually wear out. The squealing or vibrating is a sign that it’s time for brake replacement. 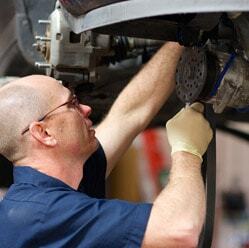 Postponing brake service can lead to serious problems and expensive repairs down the road. Don’t take chances with your safety by driving around with worn brake pads. Instead, allow our ASE-certified technicians to replace your brakes. We replace drum and disk brakes for all makes and models. Trust our brake repair team to keep your braking system in excellent operating condition. Squealing, grinding, or shaky brakes do not always indicate bad brake pads. Instead, the real problem may be your brake rotors. Whenever you press the brake pedal, your car’s brake pads squeeze the rotors. The rotors begin to wear and develop small imperfections, which become more noticeable over time. By providing brake rotor replacement, we extend the life of your pads and ensure smoother braking. in Greenwood Village, Englewood, Denver Tech Center, Meridian, and Inverness, Colorado.